So here in the USA, we are entering my favorite season–FALL! I live in the northeast part of the country, where the colors of this season are truly beautiful! I’m so excited for the leaves to change colors and for the weather to cool off a bit–its still in the 90s here smh! Plus i love drinking hot chocolate, teas and my favorite Starbucks drinks in this season. But undoubtedly, the best thing about Fall/Autumn time is the F A S H I O N! I loveeeee coats, sweaters, boots, and scarves! Super excited for that to begin! Anyways, i thought i would do a 2 part post about fashion looks i’ve recently worn to work and out–that showcase outfits that transition to fall. The color tones and outfit choices are simple yet stylish and are a perfect way to begin your wardrobe transition to this new season. My sister is also going to be featured in this post and the next one, shes not a blogger or anything, but i asked her to join me in this and she said yes! She has 1 outfit in this post and 1 in the next. Hope you guys like these looks! My favorite part of this outfit is the pants. I got them pretty reasonably at H&M a few weeks ago, and i LOVE the color! It’s a perfect shade of teal almost that i don’t own so i bought it instantly. It’s simple to pair with basic tops or a printed one. Can’t wait to style it more as the season continues! I love the color combo i used in this outfit, because it’s a perfect blend of beige brown and white. Earth warm tones. This cardigan is going to come in so handy this season as its so simple to pair with anything. The pants were a bit pricey at H&M, but it was worth it since i don’t own this color of pants and their easy to fold at the bottom so i can wear nice shoes with them. This simple light blue top is so easy to wear on a casual Friday. 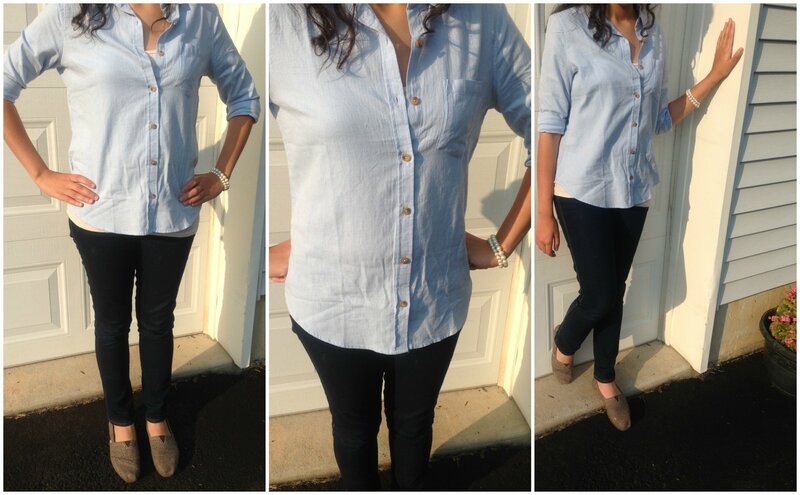 I paired it with dark wash jeans ( a must have for the fall time) and my toms. I wore a tank top to under the button down to layer it (another favorite about fall time) and i loved the simplicity of this outfit! 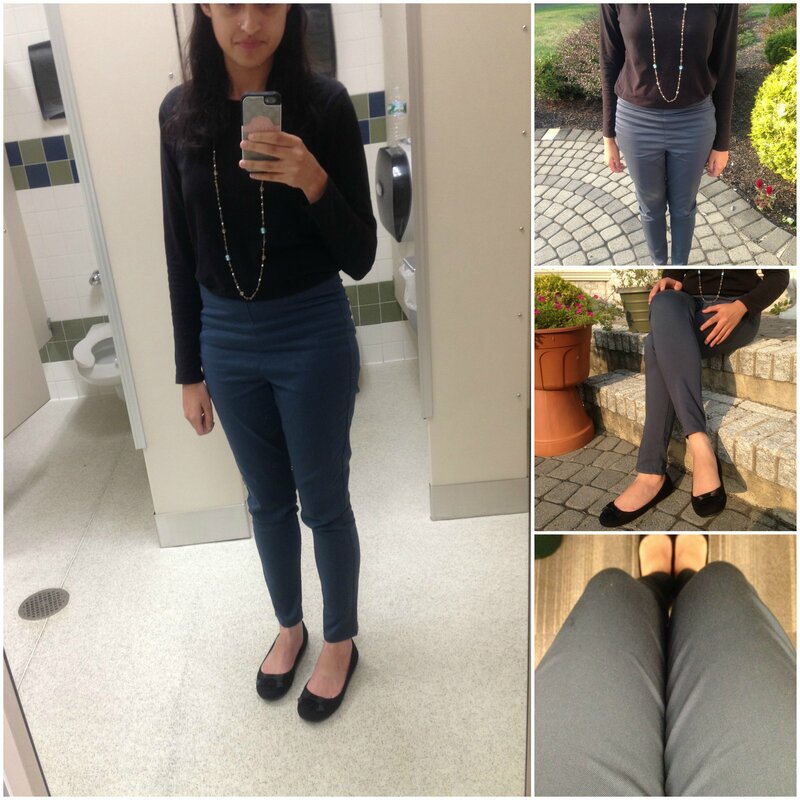 Lastly, what better way to end and transition to fall then wearing your printed pants? 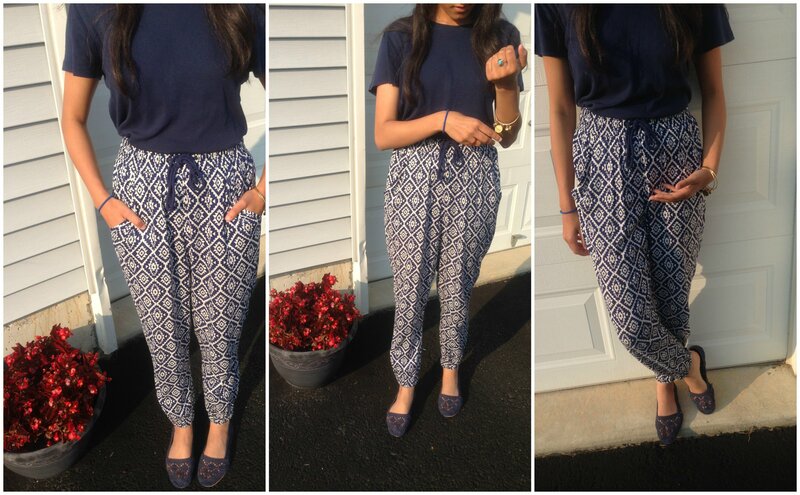 My sister wore this outfit to school and it’s a fun way to incorporate prints with basics. I love the color because obviously, i love blue. The outfit is perfect to wear as a last hurrah to the end of summer! That’s all for this post guys! Let us know which of these 4 looks you liked the best! I’ll be back next week with the 2nd post of this two part series, with 3 more looks for you all! Would love your feedback and support, don’t forget to follow me here & on my Instagram as well! Previous Post Labor Day Weekend; recap! Next Post Transition to Fall–Lookbook: Part 2! Hey 🙂 I love your blog and I nominated you for the blogger recognition award. I can’t wait to see your answers!